Comets (COMputation of Electric field due to Transcranial current Stimulation) is a MATLAB toolbox for simulating local electric fields generated by transcranial direct current stimulation (tDCS). 3D numerical computation of electric fields generated by tDCS has widened our insights into the underlying mechanisms of stimulating current conduction, accelerated the development of new electrode montages, and enabled more accurate field concentrations to targeted brain areas. However, since there has been no well-established field simulator specifically designed for the analysis of electric fields due to tDCS, only a few research groups could access this technology. Since Comets has simple and interactive graphical user interfaces, the users can readily simulate various electrode configurations, electrode sizes, and electrode orientations, without a need to code any MATLAB scripts. Comets evaluates the 3D cortical current distributions based on the electrostatic finite element method (FEM). Although only a standard human head model is provided in the current version, users may import their own head model datasets for specific research purposes. For advanced 3D visualization of resultant cortical current distributions, the output data can also be exported to readily accessible ASCII-format data files. The toolbox package is freely available at http://cone.hanyang.ac.kr or http://www.cometstool.com for noncommercial and academic uses. Currently, our toolbox cannot be used for a medical use, but for research and education purposes only. 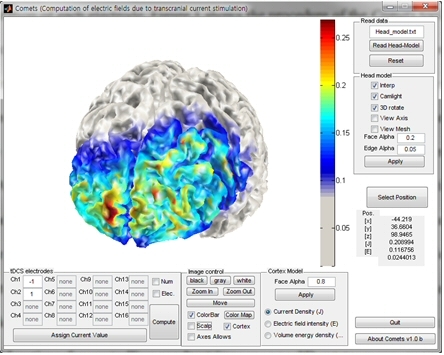 In 2003, our research team released a Windows-based graphical user interface (GUI) MATLAB toolbox, named COMETS, with the aim to provide unexperienced users with an easy way to simulate electric field distribution due to tDCS inside a standard head model, based on 3-D finite element analysis (FEA). For the last three years, this MATLAB-based toolbox has been extensively used for estimating cortical current distribution due to tDCS by several research groups. However, electrode modeling in COMETS was not realistic because forced boundary conditions were directly applied to scalp nodes, and thus the electrodes could not be modeled as exact rectangles. Furthermore, a default head model was simple and the brain area was not separately modeled to reduce the computational burden. Here, we release an advanced version of COMETS, named COMETS2, which is also a Windows-based MATLAB toolbox as the previous version. Contrary to the previous version of COMETS, COMETS2 can automatically generate hexahedral electrode pads, simulating sponge-type electrodes, of which the sizes and angles are freely adjustable. A realistic human head model composed of scalp, skull, cerebrospinal fluid (CSF), and brain is included as a default head model. A user generated head models (e.g., SIMNIBS) can also be imported for the individualized electric field simulations. Most importantly, an efficient technique for reducing the overall computational cost during the repeated simulations is proposed and implemented. COMETS2 is MUCH FASTER than COMETS1 although it adopted more complex and realistic head model. - Advanced users can import their own head models generated using CURRY, SIMNIBS, etc. To download the latest version of Comets, please click the above logo picture! (12/04/01) Comets 1.00b was released for the first time. (12/11/10) Comets 1.03 was released (latest version - many bugs were fixed). (18/09/17) Comets 1.04 was released - Now COMETS1 can be run under recent Matlab versions (after 2014 version). A manuscript introducing Comets2 was published in Journal of Neuroscience Methods. Please cite the following paper if you use Comets2 for your publication. If you want to receive news of Comets, please send us your E-mail address along with your name and affiliation. We welcome user feedbacks for improving the toolbox! !